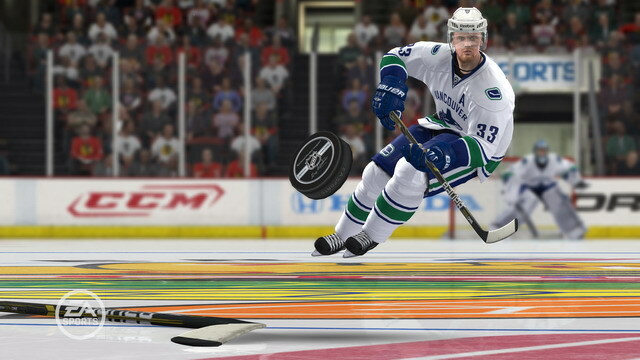 EA sent us a double-whammy of hockey this weekend, 2/3rds of a Hat Trick to be precise. The latest for the Wii (NHL Slapshot ), and then the more "grown-up" version for the Xbox 360 (also available on PS3). It's been a few "seasons" since I've hit the ice, but it's just as I remember it. The feel of the arena's captured by EA give me that familiar feeling of what it was like when the Phoenix Coyotes were a decent team. Yes, we actually have a hockey team in the scorching desert I call home, and I've been to many-a-game, heck, I even took my wife to a game for our first "official" date, nigh on 7 years ago...ah yes. Hockey memories. This marks EA's 20th year lacing up the skates, and they aren't skimping with all the new features and game modes to sink your teeth into. In fact, the pure overload of game modes has me (normally not a huge sports fan), a bit overwhelmed. 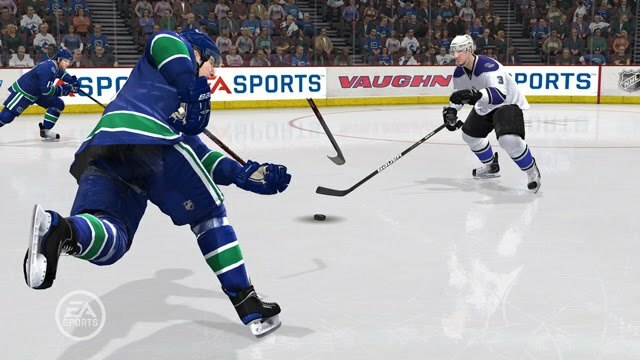 There's a new real-time physics engine which has been touted to enhance the way you play like "never before", apparently this also causes broken sticks. Which of the half-season as the Vancouver Canucks, I've not had one broken stick...(many broken bones from fighting however). Gameplay is almost 100% controlled by the two analog sticks. At first I was not sure how much I'd want to rely on my own fingers to aim the puck...however after a few games, I had a decent rhythm down, and it only got better the more games I played. 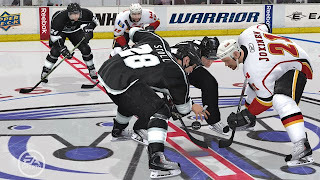 Even the faceoffs and hip checks are all pulled off with the analog sticks. Also new this year (the list is pretty substantial); is the all new Hockey Ultimate Team, where you can take your dream of building your own Hockey franchise from the ground-up picking from the top CHL and AHL talent and forming a winning squad. This feature incorporates well if you know alot of people who play online, as there's a regular season and monthly playoffs online. I can't say I get into that, though I understand the draw there. My guess if you heat-mapped this feature, the northeast and Canada would be a hot-spot of gamers who are playing this feature. The continuing "Be A Pro" mode is even further enhanced, cause you'll be able to begin your career starting at the very lowly bottom, playing for the Canadian Hockey League, the "minors" if you will. Then, you can earn your way to the NHL, and then hopefully onto a good team. 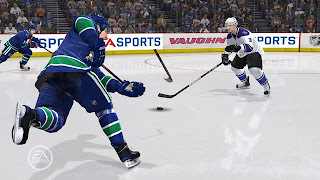 Graphics are always getting better, as I always go back and compare to NHL 98 for the original PlayStation, that I spent an entire summer playing as I was just getting into the sport. The animations of the players are sharp and unique, and the overall presentation, with the announcers offering up a true commentary of not only the immediate action, but overall team performance as the season progresses. 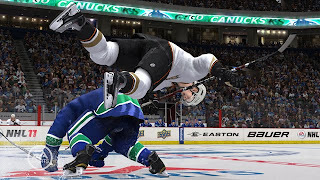 Again, I'm not a huge sports fan, nor am I an ultimate hockey fan, however, that being said, I can safely say that those of you who are, will find a lot to love in EA's latest. I know I do. 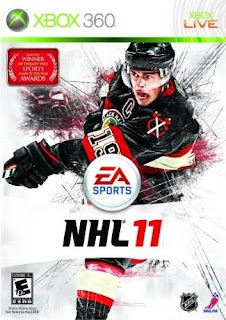 Mashbuttons.com gives NHL 11 a 9 out of 10.